You take ski racing seriously, now you can preserve your memories seriously. Note: I don’t do high volume work like an event photographer that you would typically see at a race, so as much as I’d like to, I’m not able to sort, process and provide proofs for free. I am a full time fine art landscape photographer which I love and “focus" on. My daughter ski races. If you are here you probably met me at a race. I’m at the races primarily to support her, but while there I am shooting every female athlete with my fine art landscape equipment. I’m shooting ski racing as fine art and producing the images the same way as my Limited Edition work, up to 4 feet wide on metal. In order to have my name on it, it must represent who I am as an artist. For the right client, this is a unique opportunity to obtain coaching insights and a one of a kind original fine art piece featuring your athlete. If you are curious what this might be like, use this button to request a sample image of your athlete. I will spend about an hour to find an image of your athlete that I feel represents my work, do a preliminary hand edit and send you a digital file ready to post to Instagram with my watermark. Which of these races have you competed in? I may have shots of the awards, let me know if your athlete placed and I'll check. If we talked about anything special, remind me here. If you saw me at another race not listed above, list it here. I will find a picture that I like of your athlete and send it to you as soon as I can. If we are at a race, please allow additional time as I’m shooting and tuning race skis!!! If you like your image and the other examples of my work on this site, and you would like to move forward the next step is to make the Proof Service Deposit of $225. (Proof Service is complimentary with the purchase of a Limited Edition Fine Art Print). The deposit can be used towards anything I offer and will never expire. 50% discount for siblings. Print Selects - these are images I am excited about producing in a large format (2 -5 feet wide). It all needs to come together - the athlete, the light, the capture. Images that have all of these are included in this gallery. I will do a preliminary edit to show my artistic vision for each piece. You can of course request any of your images be produced. Coaching Shots: This is for coaching your athlete and is meant to be shared with your coaches. I will rough crop these and do light edits just for coaching purposes. Some of these may even be out of focus if it shows anything useful for coaching. If you see something you are interested in purchasing in this gallery, let me know what format you are interested in and I will let you know if it's possible. If you pre-order I may be able to take more images for you. A client at Loveland shared these with her bootfitter who made a cuff adjustment based on the shots, and her coaches who designed a drill for her based on what they saw. This is what I do for a living. I will produce a one of a kind Randy Thomae original metal print of your athlete using all of my Landscape Fine Art printing tools and methods. Prints are ready to hang without a frame and float off the wall one inch. Print purchase includes the corresponding Digital Files described above. US Shipping included, sales tax (if applicable) is not. Custom sizes available. Multiples or reprints of the same image at same or smaller size get a 20% discount. I stand behind everything I do and will do whatever it takes to make sure you are satisfied. I have a passion for ski racing that began with chasing my daughters all over Colorado. I have served on the board of directors of Lake Eldora Racing Team, trained Masters ski racing, and attended the US ski team Club Excellence workshop in Park City, UT at the US Ski Team HQ. 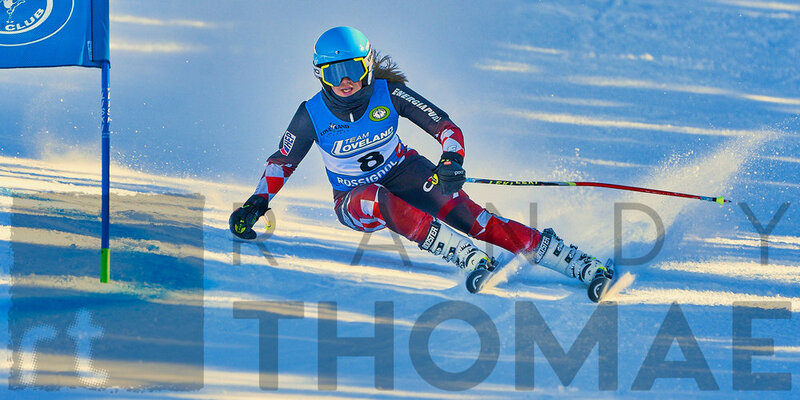 I shoot ski racing like I shoot landscapes - painstakingly, with professional equipment. My hope is that I can provide parents who are looking for something special a unique way to celebrate their athlete and meet potential collectors for my Fine Art work.